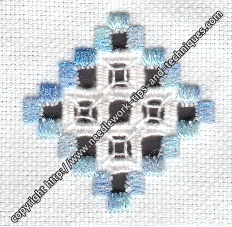 Welcome to lesson one in my hardanger needlework course. Stitch along with me as I introduce you to this wonderful Norwegian embroidery, in a series of tutorials that will teach you the basic stitches and techniques. Although traditionally worked in white thread on white fabric I would suggest that if you are new to hardanger needlework you begin by using coloured threads so that you can see what you are doing more easily. Your first step is to print this page so that you can go and work somewhere more comfortable. I am sorry about the copyright info across the pictures. Sadly, it is there because some unscrupulous people stole my content and put it on their own Web sites. 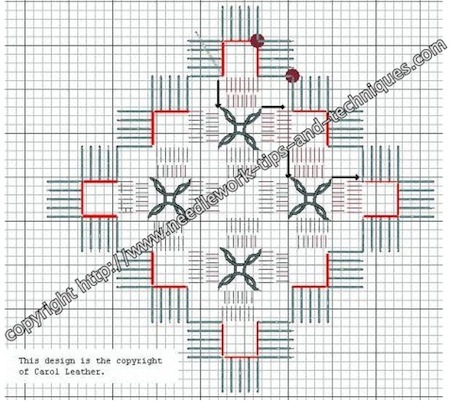 My hardanger charts use a graph line to represent a fabric thread. Some other designers reduce the size of their charts by making one line represent two threads, so please check any other chart for this information before you start. 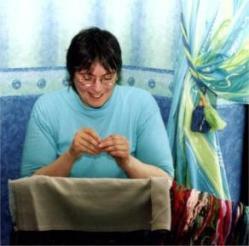 Find the centre of your fabric by folding it in half both ways and lightly creasing. Thread your needle with the thicker No. 5 thread and tie a knot in the end. I know, you've been told never to use a knot! This one is different. It is called an away waste knot and it won't stay in your work, we will cut it off later. For the time being pop your needle through the corner of your fabric, from the right side, leaving the knot on the top surface of your work. Count up 18 fabric threads from the centre and bring your needle through from the underside at no. 1 on the chart, to begin stitching the first kloster block. Each stitch covers 4 fabric threads. It is important to follow the numbering on the diagram to ensure that there is the same amount of thread on the back of your work as there is on the front. If you take a shortcut and miss out a number on the diagram your stitches won't hold when you start the cutting process. Continue following the chart to work all the kloster blocks, counting carefully so as to meet up at the beginning again. Remember that waste knot? Now is the time to snip it off and check that your stitches have anchored the starting thread on the back of the work. If you find that you run out of thread before completing the kloster blocks please try to finish a whole block before starting a new length. As you stitch with the thread it tends to loose a little of its sheen and it would be noticeable if your block consisted of both old and new thread. The next step is cutting and removing some of the fabric threads. 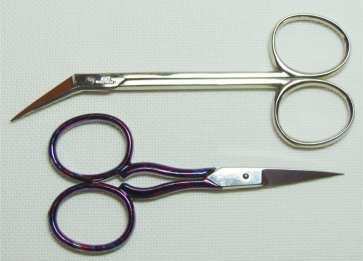 For this you need small, sharp, pointed embroidery scissors. Sometimes students have turned up to my workshops with dressmaking shears or childrens paper scissors, neither of which will be capable of the delicacy needed here. It is worth investing in a special pair of hardanger scissors with angled blades if you think you will be doing much hardanger needlework, although either of the type shown above will work well. The most important thing to remember when cutting is to continue breathing. So many students hold their breath at this point I have been worried that some may pass out in the class room! 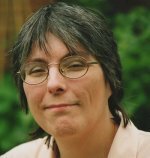 Looking at the chart, can you see the red lines inside the kloster blocks? These show you where you need to cut the fabric threads. Basically you always cut along the edge of the block where the stitches go down into the fabric, NEVER parallel to the stitches. Please count twice, cut once. By this I mean double check you have the right number of fabric threads on the scissors before you close the blades. Then cut all four threads with one snip. If you do happen to cut too many threads it isn't the end of the world, you can take a thread from the edge of your fabric and reweave it through. Time consuming but it works perfectly. As we are working with coloured thread for this hardanger needlework project you may find small tufts of fabric thread show after you have cut them. Do not worry about these, they will shrink back underneath the kloster blocks when the piece is washed. They would be less noticeable if you were using white thread. After the cutting is completed you should end up with your work looking like the photo above. So far our stitching has been with the thicker thread, now we turn to the thinner perle number 8. All the needleweaving and the lacy square filets will be worked with this thread. Use the kloster blocks to anchor the thread we don't need to use a waste knot here. I have shown this on the chart by a diagonal line underneath a kloster block. You will have four fabric threads in each position, forming a grid inside your kloster blocks. Take the first group of four and weave your needle through them, going over two, under two backwards and forwards until the threads are comfortably full of stitches. Don't squeeze too many on or the bar you have made will bend and look untidy. If you keep an idea in your head of how many stitches you use you can repeat this for the remaining bars so that they all match. 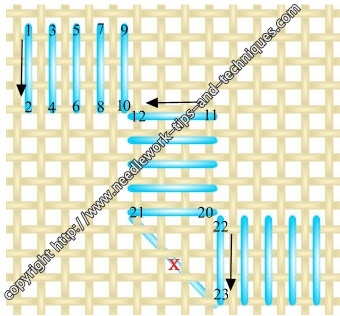 This process is called needleweaving. 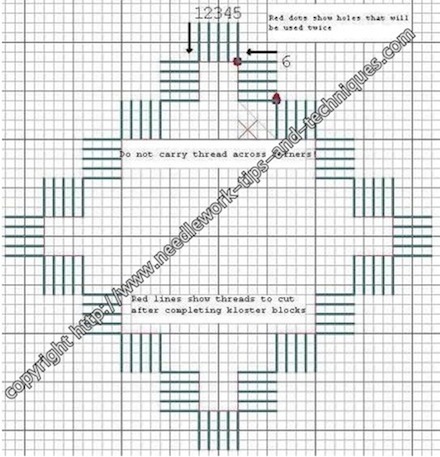 Many hardanger needlework patterns will use this technique but some will have wrapped bars (which we will cover in lesson two of our beginner guide to hardanger. Work the bars in a diagonal direction by working those coloured red on the chart first. Then turn the work and work a second diagonal row in the opposite direction. Continue until all the remaining bars are worked. I have chosen square filets as the decoration for this first hardanger needlework piece. These can be worked after all the needleweaving is complete. The other main lacy stitch is a doves eye, which needs to be worked at the same time, so I have left that for lesson two. The square filet is simply four buttonhole stitches, taken into each corner of the "square hole". In order to make the fourth stitch look the same as the rest you need to take the needle and thread down over the the thread already leading from that corner. I will try to make a video of this soon to make it easier to follow. Run your thread through the back of kloster blocks again, in between square filets. Congratulations! You have stitched your first piece of hardanger needlework!